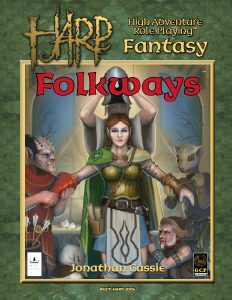 Folkways is a reference guide and epic fantasy supplement for HARP Fantasy, written by Jonathan Cassie and published by Iron Crown Enterprises. Folkways is actually two books in one. The first half of the book is the Folkways portion – a reference guide designed for fleshing out a setting. The second half of the book is supplemental material for HARP Fantasy, providing new races, professions, and training packages that have more meaning within HARP Fantasy than they do otherwise. I make this last comment because the Folkways half of the book is completely system-agnostic and applies to any setting, any genre, any game system. I’m going to discuss each half of the book separately. There are many guides available for building a unique setting for your game. There are also hundreds of settings available across multiple genres and game systems. Most of those settings provide enough information to get your game going, make it interesting, and provide enough for the PCs to explore. Often times, there’s no need to delve too deep into the setting by fleshing out the details of each culture (or at least each main culture) within that setting. The keyword to take away from this is “culture”. This is not a discussion of species, race, or ethnicity (although it could be a combination of the three), it is literally fully fleshing out the nuances of what makes a culture what it is. This is where the Folkways material comes into play. Folkways is a guide for detailing these deep elements of your culture by using the twenty questions method. Each question details a “way” (or detailed element) regarding the culture. The twenty ways include environment, family, marriage, lifespan, rank, authority, and a number of others to reach twenty. I’m not going to detail this information as it would literally spoil the IP developed within the book. In other words, you need to buy it in order to find out what this stuff really means. By answering each question, you build the detailed elements that makes a culture, a culture. This creates a truly three-dimensional setting where many questions can be answered. Granted, this is really only useful if you are spending a lot of time within a given culture and plan on developing the character’s “career” while surrounded by that culture. Otherwise you could be providing more detail than is truly necessary. But if you do want to flesh out your setting further to create an actual culture, then this guide leads the way. Oh, and it’s completely generic, with not a shred of game mechanics, and thus can be used for every RPG. The second half of the book is supplemental material for HARP Fantasy. Really it’s just material that adds more options to your HARP Fantasy games. I’m not really sure why this material was added to the reference portion of the book, but I’m thinking it has to do with connecting the Folkways content with the heart of HARP Fantasy. 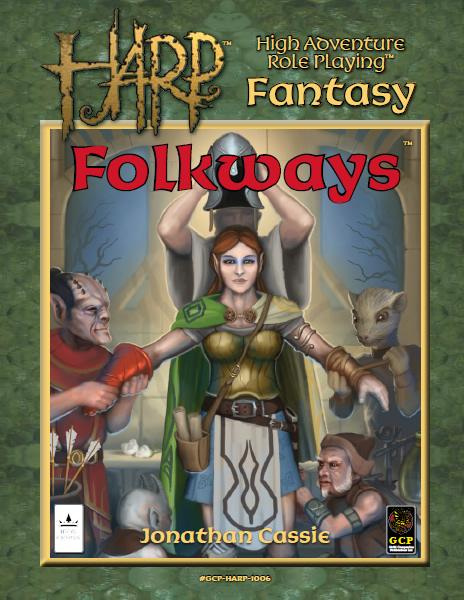 It also could have been done to make the book more valuable, by presenting in-game content, but either way it helps to connect the Folkways with HARP Fantasy. I will note that even the HARP Fantasy content is generally mechanics-light and can easily be translated into other game systems. In all honesty, there’s no reason why you couldn’t use this entire book with another game system. Not that I’m trying to say it should be used outside of HARP, I’m just saying that it has potential value outside of HARP. As for the Folkways, it has value everywhere!